Would Bracing Help With Your Joint Instabilities and Pain? Leduc Physio - Physical Therapy and Massage Therapy ServicesWould Bracing Help With Your Joint Instabilities and Pain? Every time you take a step your knees are bearing 3x your bodyweight, and up to 5x if you’re walking down stairs or downhill! The knee joint is the largest joint in the human body. Although the largest, it is the most vulnerable for injuries since it withstands an incredible amount of impact while in a flexed position. Alike the elbow joint, the knee is able to bend and straighten, but also rotate slightly from side to side. Injuries to the knee can be very debilitating and painful. They can be caused by a quick accident or result from an ongoing issue, such as poor biomechanics or diseases like Osteoarthritis. Some of the most common knee injuries are caused by damage to the surrounding ligaments. The four ligaments of the knee that are prone to injury are the Anterior Cruciate Ligament (ACL), Posterior Cruciate Ligament (PCL), Lateral Collateral Ligament (LCL) and Medial Collateral Ligament (MCL). Since these ligaments work together to stabilize the knee and prevent unwanted movement, injuries (such as tears) to these fibrous connective tissues can severely reduce the overall stability of the knee. What Do Knee Braces Do? After facing issues with the knee that has reduced the overall stability of the joint, many individuals consider wearing knee braces. But what are the braces doing? How will they help? There are a variety of different braces on the market, each designed with different characteristics to manage specific conditions and give the necessary support for each user. The main purpose of each knee brace is to either provide compression to the knee while managing inflammation or provide artificial stability through the use of rigid frames and/or hinges to the weakened joint. Leduc Physio offers a few options for knee bracing at a range of prices. Each brace has a different goal/purpose and some can be custom fit. Leduc Physio braces with the DonJoy brand; they offer a great warranty program, and are the choice for multiple national sporting leagues. 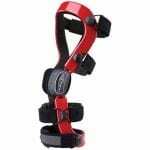 The Hinged Performer brace is the most cost effective option for knee bracing. It is used to stabilize the patella (aka the kneecap), and provide some side-to-side support to the knee. 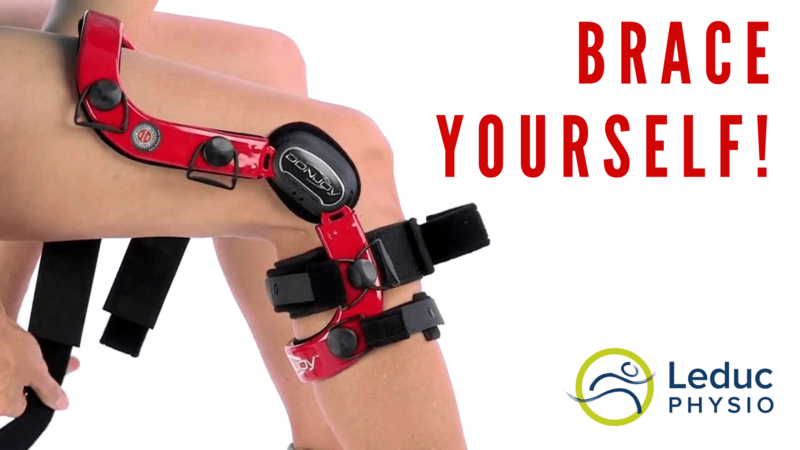 It is a perfect brace for individuals looking for mild to moderate knee stability, support for an ACL or PCL strain, compression for osteoarthritis, or those looking to correct patello-femoral dysfunction. This brace should not be used to prevent injury as it provides only mild to moderate support for existing injuries. The Webtech brace can decrease knee pain and increase function to keep you moving in your active lifestyle. The elastomeric web absorbs shock, disperses energy and shifts pain away from your knee. It has a very slim profile, and an open back to increase air flow. 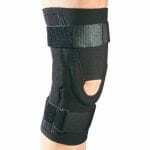 This brace has limited side-to-side support, but helps with patellar tracking and decreases knee pain during movement. 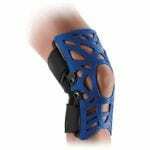 If you have knee pain while walking, running, playing non-contact sports, or just being outside in the yard this brace is a good choice. The Renegade is the closest thing to a custom knee brace without the price tag. It is made to support moderate to severe knee instabilities, ACL injuries or reconstructions, MCL/LCL instabilities, prevent hyper-extension, and prevent injury during activity. It has a rigid frame to provide maximum stability and strength to the knee. 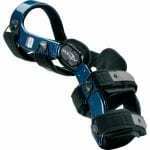 This brace is built for demanding sports or activities (with no contact) such as court sports, water sports, mountain biking, surfing, etc. The Defiance III brace is a fully custom brace intended for high-collision activities or contact sports. The Defiance III brace is the gold-standard for knee bracing. It has a strong lightweight carbon fiber frame, with lifetime warranty on the frame and hinges, and there are many color/print options to choose from. 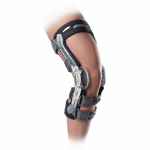 This brace is recommended for individuals experiencing knee hyper-extension, moderate to severe ACL or PCL instability, and ACL or PCL reconstruction. The Defiance III brace is often used to support the knee in high-impact sports such as: rodeo sports, motocross, downhill ski racing, surfing, football and rugby. It can be worn in the water, and all straps/pads are removable for washing. The A22 brace was created for knees that have ACL instabilities (pre- and post-surgery) and help prevent hyper-extension of the knee without being involved in contact/collision sports. It is made from titanium, an extremely light and strong metal. Braces are custom measured for a perfect fit and have a 1 year warranty. If you are a runner, play court sports, golf, compete in track, dance/gymnastics, or any water sports; this brace can provide optimal support during activity and prevent further injury to your knees. 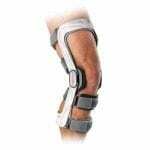 The best of the DonJoy knee braces for osteoarthritis (OA). It is designed for individuals suffering with OA, who want to stay active. It is extremely lightweight and provides durable support for moderate to severe levels of osteoarthritis. The hinge bars offer support for ligament instabilities and offload pressure in the knee that naturally causes discomfort on one side of the knee. Braces are measured custom for the best fit, they have a lifetime warranty, and you can pick your color. While many people who wear braces swear by their product, it is important to keep in mind that bracing is arguably the least important part of preventing and healing from knee injuries. Improving strength and flexibility of the knee are much more important to the health of the joint. Focus on stretching and strengthening the muscles surrounding the knee and consider improving daily biomechanics, such as when walking up stairs and kneeling at work. While knee braces can be very beneficial while injuries are healing, painful joints need offloading or you are protecting the joint during contact sports, it is important to not allow the brace to become a “crutch” and solely depend on it for stability. If the surrounding muscles, ligaments and tendons are not subjected to daily stresses, they will weaken and be even more prone to injury. To learn more about what knee brace may be right for you or to gain information about strengthening your knees, book with our Kinesiologist at www.leducphysio.janeapp.com or call the front desk at (780) 980-5443. If you liked this article, don’t forget to subscribe to our newsletter and follow our social media feeds for updates on what’s happening at Leduc Physio!